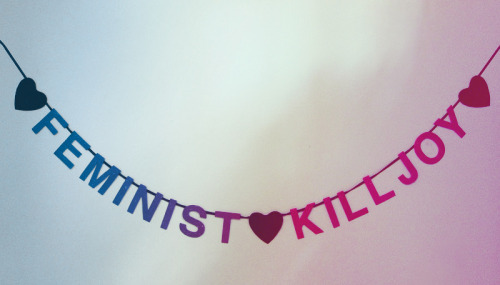 “Feminist Killjoys.” The Promise of Happiness . Durham, NC: Duke University Press, 2010. This chapter fits within Ahmed’s larger work on affect aliens, or people who are are read as unhappy because they live outside normative ideas of happiness (the hetero-family, for example) and are therefore alienated from the community because they are not affected as they should be. Her chapter on migrant melancholy is also really helpful and has a really solid critique of Bend it Like Beckham, if you’re so inclined. According to Ahmed, femininity is largely constructed around the fantasy of the happy housewife, “a fantasy figure that erases the signs of labor under the sign of happiness” (50). This figure operates under the assumption that working for the family makes women happy and that happiness motivates the work they do. Of course, this figure also conceals the domestic labor done by women of color and working class women who often invisibly support the work of the “happy housewife,” or whose work outside the home is not a matter of choice (as Projansky critiques elsewhere) (51). Looking to the resurgence of the happy housewife archetype (Mommy Bloggers, Pinterest, I’d say), which she sees a s a placeholder for women’s desires, Ahmed asserts: “The image of the happy housewife is repeated and accumulates affective power in the very narration of her as a minority subject who has to reclaim something that has been taken from her. This affective power not only presses against feminist claims that behind the image of the happy housewife was an unspoken collective unhappiness but also involves a counterclaim that happiness is not so much what the housewife has but what she does: her duty is to generate happiness by the very act of embracing this image” (53). Ahmed moves through an analysis of how happiness is used to justify unequal divisions in labor (53) and education as an orientation device to a particular type of social values (54-55) to an argument about how happiness is used as a sort of boundary on gender roles: “Any deviation from gender roles defined in terms of women being trained to make men happy is a deviation from the happiness of all” (55). The goodness of women is thus judged on the happiness of their homes and the happiness they give others, rather than their own merits or happiness. From there, Ahmed goes into a quick, but helpful explication of different philosophies of happiness, including conditionality, sociality, communities of feeling, and fellow-feeling (56-67), which helps to make clear the way in which the happy housewife’s happiness is not really about her happiness and how therefore happiness is used as an instrument of hegemony. She also has what, to me, is a really helpful paragraph about the happiness imperative for children, who must be happy because their parents have deferred their own happiness into the success of the next generation through self-sacrifice of time and resources (59). Within this framework, then, feminists are troublemakers because they refuse the imperative to be happy. Through a reading of The Mill on the Floss, she charts the association between the female imagination and trouble as “it teaches us how the happiness duty for women is about narrowing of horizons, about giving up an interest in what lies beyond the familiar” (61). She writes, “Feminist readers might want to challenge this association between unhappiness and female imagination, which in the moral economy of happiness, makes female imagination a bad thing. But if we do not operate in this economy–that is, if we do not assume that happiness is what is good–then we can read the link between female imagination and unhappiness differently. We might explore how imagination is what allows women to be liberated from happiness and the narrowness of its horizons. We might want the girls to read the books that enable them to be overwhelmed with grief” (62). In Ahmed’s reading, “to be good as a girl is to give up having a will of one’s own” (62). Conventional happiness for girls and women is about giving up on one’s own desires in favor of keeping the peace, fulfilling duties, and making others happy. It can also be a way of “avoiding what one cannot bear” (64). So, the feminist killjoy then is a figure of unhappiness because she disrupts the ease of other people to be affected by the objects and practices that are supposed to make them happy. “Feminists might kill joy simply by not finding the objects that promise happiness to be quite so promising. The word feminism is thus saturated with unhappiness. Feminists by declaring themselves as feminists are already read as destroying something that is thought of by others not only as being good but as the cause of happiness. The feminist killjoy ‘spoils’ the happiness of others; she is a spoilsport because she refuses to convene, to assemble, to meet over happiness” (65). Finally, in her conclusion, Ahmed argues that “Feminist consciousness can thus be thought of as consciousness of the violence and power that are concealed under the language of civility and love, rather than simply consciousness of gender as a site of restriction of possibility” (86). She calls for a revitalization of the critique of happiness and suggests that to be willing to do so is to be willing to be “proximate to unhappiness”. But, “There is solidarity in recognizing our alienation from happiness, even if we do not inhabit the same place (as we do not). There can be joy in killing joy. And kill joy, we must and we do” (87). ***”My experience of being a feminist has taught me much about rolling eyes. This is why when people say the bad feeling is coming from this person or that person, I am never convinced. My skepticism comes from childhood experiences of being a feminist daughter in a relatively conventional family, always at odds with the performance of good feeling in the family, always assumed to be bringing others down, for example, by pointing out sexism in other people’s talk. Say we are seated at the dinner table. Around this table, the family gathers, having polite conversations, where only certain things can be brought up. Someone says something that you consider problematic. You respond, carefully, perhaps. You might be speaking quietly; or you might be getting ‘wound up,’ recognizing with frustration that you are being wound up by someone who is winding you up. The violence of what was said or the violence of provocation goes unnoticed. However she speaks, the feminist is usually the one who is viewed as ‘causing the argument,’ who is disturbing the fragility of peace” (65).